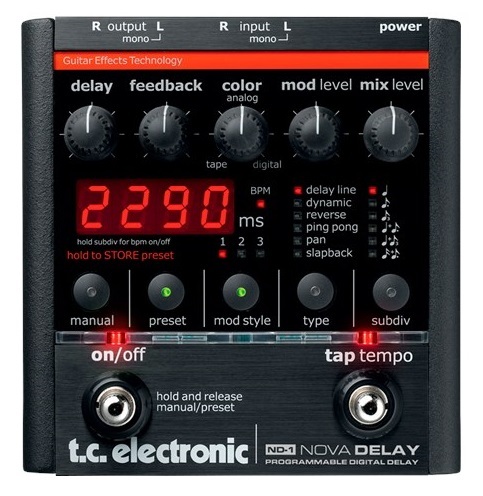 TC Electronics wants to move forward into the new and when we saw a need in the market for a compact, yet feature-rich delay pedal, we knew exactly what to do – introduce the Nova Delay! Decides how the notes are divided. In dual delay mode, it’s possible to have different outputs for left and right! Whatever you wanna do, the subtypes make sure your rythmic delays are in time with your music/band/backing track. Originating from the 2290, this is a delay that waxes and wanes with your playing naturally. Very cool. Whether you want classic backwards guitar to channel your inner Hendrix or Beatle, or opt for an experimental shoegazer-approved soundscape – the reverse delay will deliver. Jumps between left and right stereo channels, giving off a nice spacey vibe. Slowly pans across the stereo image. The characteristic, short delay you know from the 50s, rockabilly and country music. Dial in tempo in Milliseconds or BPM. Tap, dial-in or strum in your desired tempo! Voltage: 100 to 240 VAC. AC wall adapter included.